Slots Zoo is an online casino that offers an outstanding collection of casino games consisting of slots, table games and lives dealer games. Inspired by wild animals, the zoo theme invited online patrons to enjoy hours of great entertainment in an environment safeguarded via 128-bit SSL encryption while all software are certified as RNG and fair. Slots Zoo Casino attracts a large international player audience via its trustworthy deposit and withdrawal options, fabulous VIP system, and incredible support available via telephone, email and live help. Apart from the impressive gaming selection, Slots Zoo Casino's popularity is due to its brilliant variety of different bonus options that provide members with ample reason to return regularly since new innovative bonus opportunities are added on a regular basis. The most appealing bonus is the welcome package that offers new members huge bonuses worth up to £1,600, to explore the broad range of games. The package consists of two free bonuses starting off with a 200% bonus on your initial deposit worth up to £800. To qualify for the generous bonus, new members need to quote bonus code ZSLOTS200 at the time of making the first deposit. At Slots Zoo Casino your second deposit enjoys an even higher bonus of 250% worth up to £800 when bonus code ZSLOTS250 is used. A deposit of no less than £20 can unlock both bonuses, and the deposit and bonus are subject to wagering of 30 times before withdrawals will be granted. For players from Greece the wagering increases to 80 times and for Sweden, Norway, Finland or Denmark players the playthrough requirements are 40 times the bonus and triggering deposit. The bonus can be used on slots exclusively, and bets placed on other games will result in the bonus as well as winnings being voided. While the casino do not offer any deposit bonuses, free coupons, or no deposit bonuses, other promotions offered to Slot Zoo members include Tuesday top up's, weekend reload bonuses, a 150% night owl bonus as well as free spins to early risers. The VIP system is described as the king's watering hole, and complimentary points are awarded for loyalty while personal VIP managers take care of VIP managers every need and wish. Several banking methods are in place to make members experiences pleasant, and deposits and withdrawals can be made via Visa, Ukash, MasterCard, Skrill, Neteller, POLi, postepay, iDEAL, giropay, Maestro, Visa Electron, Nordea, and sofort. Mobile users can access the wide selection of Zoo Slots Casino via their browsers or the QR code provided on the casino website, bookmark the site for easy access via a shortcut on their home screen and log-in with the same code and password used on desktop. Slots Zoo Mobile Casinos can be enjoyed from all Android devices as well as iPad and iPhone. Slots Zoo's largest level of popularity is found in Dutch speaking countries, as well as Canada and other English-speaking countries such as the United Kingdom. Slots Zoo Casino's exciting gaming collection features several categories including new games, video slots, video poker, live casino, classic slots, scratch cards, card and table games, action games and micro bet games. 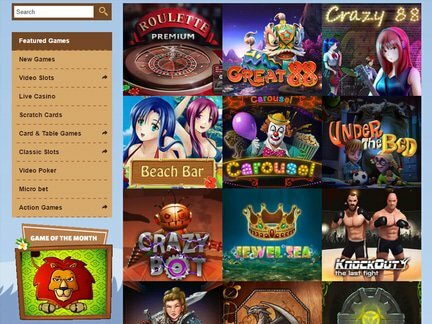 Several of the world's most reliable software providers have partnered with Slots Zoo Casino to increase gaming enjoyment for all members and include NetEnt, BetSoft Gaming, NextGen Gaming, Amaya, GameArt, ELK Studio, Nektan, LightningBox, Thunderkick, GameScale, Extreme Gaming, and 1x2 Gaming. New games are added regularly and currently include Smoking Dogs, Crazy Bot, Grand Jumo and Crazy 88. The video slot selection offers two subdivisions, which include 5 to 19 payline games separated from slots featuring 25 to 30 paylines. The most popular games include Cafe de Paris, Banana Slots, Madder Scientist and House Of Fun. Classic players can select to enjoy either five reel or 3 reel titles. Live casino games created by Extreme Live Gaming include several roulettes, blackjack, and baccarat versions, while traditional card and table games such as Micro Roulette, Blackjack Surrender, Caribbean Poker and Baccarat offers captivating play. Several BetSoft Gaming titles offer progressive jackpots although no separate section is available for jackpot games. At the time of this review, complaints about the casino were unfounded. That is not to suggest that the casino has had no complaints, but does reflect that it appears any issues that have come up have been resolved in a short period of time. Slots Zoo is operated and owned by Alpha Interactive Solutions and is regulated and licensed by the Government of Curacao. All software is certified as fair, and RNG and all data transmissions to and from the casino are protected via 128-bit SSL encryption. Support is offered 24/7 via several communication options including telephone, email and lives chat. Slots Zoo Casino offers great member benefits such as regular promotions, 24/7 support, strict security and a large variety of banking methods. It would be to the advantage of players if a progressive jackpot category were added to offer direct access to jackpots awarded multi-million payouts.